"The Domain" redirects here. For the place in Hobart, see Queens Domain. For other uses, see Domain (disambiguation). By July 1788, six months after the First Fleet had landed in Sydney Cove, Governor Arthur Phillip had established "a farm of 4 hectares (9 acres) of corn" by a stream which still flows through the present palm grove into appropriately named Farm Cove. Phillip set the land aside for the Crown but did not determine what its purpose would be. He said it should be free of leaseholds but then allowed people to use it anyway, as did subsequent Acting Government and Governors. The site received the first plants and seeds brought by Phillip from Rio de Janeiro and the Cape of Good Hope. Further up the valley of the stream that flowed into Farm Cove, Governor Phillip set aside an open area for the Governor's exclusive use known as the ‘Phillip Domain’. It covered the area east of the Tank Stream to the head of Woolloomooloo (Walla Mulla) Bay. By September 1788 8 hectares (20 acres) were cleared for crops. By 1789 agricultural activity had been mainly relocated to Rose Hill (Parramatta) due to much greater crop success there, and poor soil/results at Farm Cove. The Farm Cove (Woccanmagully) area was then leased out for private farming for the next twenty years. Between 1800 and 1807 grants of land were made under Governors Paterson and others to private farmers in Farm Cove's east (Anson's Point). The main botanic garden function was transferred to Rose Hill (Parramatta) between 1800 and 1810 under Governor King. Despite a ditch being dug to define its boundary in 1792 the Domain was gradually encroached upon by others in subsequent years. Governor Bligh determined it should be the Governor's Domain in 1807 and the boundaries, especially the southern boundary, were changed. From 1807 Bligh resumed 8 hectares (19 acres) as The Domain, cancelled and converted former private farm grants on the eastern side of Farm Cove to public land incorporated back into the Governor's Domain. Farming activity decreased, buildings were demolished near (present) Government House and carriage roads around Bennelong Point and Farm Cove were constructed, along with the planting of a shrubbery and laying out of walks. Bligh's attempts to reclaim The Domain was among the many causes of the ‘Rum Rebellion’ of 26 January 1808. Mrs Macquarie's Chair was created in 1816. The southern part of The Domain was not set aside as a public park until 1810. As soon as he arrived in 1810, Bligh's successor Governor Macquarie built stone walls around the Government House garden and the Government Domain, separating them from Hyde Park. The traditional foundation date of the Botanic Gardens is taken as the date of completion of Mrs Macquarie's Road, on 13 June 1816. By 1817 the Domain was completely enclosed and the road system completed including several gates to regulate horse-drawn traffic. The Domain itself was cleared of trees and opened as a public area in the 1830s. Eventually, the Inner Domain, the area closest to Government House, was entirely consumed by the Government Gardens while the area now known as the Domain was then the Outer Domain. Macquarie improved the garden, building a protecting wall on the harbour side and constructing and landscaping a road running around The Domain, north of the Government gardens/nursery at some distance from the shore, and bridging over Farm Cove Creek to Mrs Macquarie's Chair on Mrs Macquarie's Point in the east. Swamp mahogany (Eucalyptus robusta) trees were planted to line this road, perhaps the earliest "Street trees" planted in the colony. Another 1813-1816 planting was of the black booyong (Heritiera actinophylla) west of the palm grove, which remains. On the completion of these works the area was officially inaugurated as a Botanic Garden in 1816. In 1821 the Government House stables (now the Conservatorium of Music), designed by Government Architect Francis Greenway, was completed in The Domain's north near Macquarie and Bridge Streets. Despite the Domain being whittled away in subsequent years it remained an important buffer to the Gardens. The native vegetation was cleared and the gullies of Phillip Precinct filled. During the 1830s the expansive green space of the Domain was now opened to the public, who strolled and picnicked there. The Domain west of Macquarie Street was then sold to pay for the construction of new Government House and Circular Quay. Throughout the 19th century, the south-western part of the Domain was gradually taken up by government and public buildings, including the Hyde Park Barracks, the Sydney Mint, Sydney Hospital, Parliament House, the State Library of New South Wales and the Land Registry Office. The Art Gallery of New South Wales was built on the eastern side of The Domain. In 1831 the public use of The Domain was formally invited by Governor Darling, and became accepted policy (very controlled before that). In the 1830s the Lower Garden area at the head of Farm cove was developed and the shoreline laid out in an ornamental fashion with serpentine paths. Between 1837 and 1845 Government House built in The Domain's north (north of the current extent of the Botanic Gardens). Cricket matches, which had been played in Hyde Park since the early 19th century, moved to the Domain in the 1850s. New South Wales had beaten Victoria by three wickets in their first inter-colonial match held in Melbourne in 1856. The return match was played in the Domain on from 14–16 January 1857 and New South Wales won again, this time by 65 runs. Although used for cricket for the next 14 years, the Domain was not a high quality ground even by the standards of the day. It was a rough, uneven, open paddock and cricketers had conflict with the public who insisted it was public parkland. It was also still used to graze cattle and cow pats often had to be removed before a game could begin. Despite the fact that a game of cricket was a major occasion, often attended by the Governor, and the leading players promenaded with their ladies, the ground was not enclosed and spectators could not be charged an entrance fee. These continuing problems were well known to those who attended a public meeting in the Domain on 13 December 1859 when the New South Wales Cricket Association was formed. The search began for a more suitable ground and was still going on when the first England side toured Australia in 1862. In the absence of another venue they played a NSW XXII at the Domain. A solution of sorts to the venue problem was found when the Albert Ground opened in Redfern on 29 October 1864. Although it featured good facilities for players and crowd alike, the cost to the NSWCA of staging matches there was so high that it continued to use the Domain until the early 1870s. In all, six first-class matches were played in the Domain between the 1856–57 and 1868–69 seasons. The Domain was subsequently used for military and ceremonial events and evolved as a venue for soap box oratory and political meetings. From 1860 the Domain was opened up at night to pedestrians, allowing people to use this valuable recreational space on summer evenings. It became known as the Park where the Gates Never Close. Carriage traffic however remained restricted after dusk for many years. In c. 1865 The Domain gate lodge and gates were built at the junction of Hospital Road and Prince Albert Road, and the Victoria Lodge gate house and gates were built at east of Gardens near Mrs Macquarie's Point. The growing city of Sydney put great pressure on the Domain. A major encroachment was the construction of the Garden Palace for the Sydney International Exhibition (1879). Only its gates and some statues remain after a fire in 1882. The site of the Garden Palace was later absorbed into the Royal Botanic Gardens. In 1883 2 hectares (5 acres) of Outer Domain was incorporated into the Lower Garden, completing the ring of waterfront along Farm Cove. In the 1880s the Tarpeian Rock is a prominent, dramatic and significant sandstone cliff landscape feature on the north west boundary of The Domain facing Bennelong Point and the Sydney Opera House, cut for the extension of Macquarie Street. It derives its name from the famous rock on the Capitoline Hill in Rome from where prisoners were hurled to their deaths in ancient times. A stairway gives access from close to the Sydney Opera House to the top of the rock and The Domain. An early carving in the sandstone cliff is located about 3 metres (9.8 ft) above the fifth step from the base of the cliff. The carving reads "The Tarpeian Way". It possibly dates from the time of construction in the 1880s. Between 1908 and 1916 the Conservatorium of Music was created in adapted former Governor's Stables in the Western Domain. By 1916 there were 72.6 hectares (179 acres) of gardens/Domain. During the 1920s, cut and cover tunnelling impacted the Western Domain to create City Circle underground rail line. Between 1956 and 1959 Outer Domain land was taken by Sydney City Council to construct a car park (now the Domain Car Parking station), with the resultant loss of 47 relatively rare trees, and land. The parking station can be accessed via a moving footway from College Street, near St Mary's and other surrounding roads. A number of significant political rallies and meetings have occurred in the Domain, including Palm Sunday rallies, May Day demonstrations, and anti-war and anti-conscription protests. On 17 February 1935, the Czech journalist Egon Kisch addressed a crowd of 18,000 in the Domain warning of the dangers of Hitler's Nazi regime. His visit was organised by the Movement Against War and Fascism and vehemently opposed by the Lyons Government. Kisch polarized Australian politics in 1935 when he denounced Hitler's Nazi government and warned of war and concentration camps. During the bitter election campaign following the Australian constitutional crisis of 1975 the Australian Labor Party and its leader Gough Whitlam (who had recently been dismissed as Prime Minister by the Governor-General) held their policy launch in 'the Domain' on 24 November 1975 before a huge crowd. 30,000 attended the gathering, overspilling the Domain. In more recent years, major transport projects have affected the Domain. The most significant of these was the building of the Cahill Expressway in 1952. As part of this project to build an eastern tributary to the Sydney Harbour Bridge, the small roads to the north and east of the Domain were widened into expressways. After the completion of the project, traffic moving south from the Bridge could pass through a tunnel built into the western part of the Royal Botanic Tunnels, after which it became a sunken road built into the northern edge of The Domain. The road crosses the eastern part of The Domain in a tunnel, exiting through the slope on the east side of The Domain, after which it continues south along the eastern edge of the Domain as the Eastern Distributor. The Cahill Expressway emphatically separated The Domain from the Royal Botanic Gardens, and destroyed the close spatial relationship between the Gardens and The Domain. Between 1958 and the 1960s, the Cahill Expressway resumption and construction work began, dissecting The Domain and Gardens, partly destroying Fig Tree Avenue (first entrance, planted 1847) and loss of 24 palm trees and 12 other trees lost. The Domain and the Botanic Gardens were sewered for the first time since 1792. Then in the 1970s, the rail tunnel for the Eastern Suburbs Line was built under the southern part of the Domain: the railway exits the tunnel on the eastern slopes of The Domain, after which (owing to the large change in ground elevation) it becomes a viaduct. In 1992, the Sydney Harbour Tunnel was built, with its southern section under the northwestern part of The Domain. In 2000 the toilet block in the Palm Grove was adapted and extended to become the Gardens Shop, renamed the Palm Grove Centre. In 2000-01 a new police memorial wall was erected in outer Domain to the south of the Art Gallery of NSW. The Conservatorium of Music was redeveloped with new underground extensions, demolition of trial grass beds and incorporation of new roof garden areas to gardens over the new conservatorium. A new land bridge was built (completed in 2005) over the Cahill Expressway/Eastern Distributor redevelopment, linking the Art Gallery of NSW, Mrs Macquarie's Road, Domain and Gardens, small additional land area and new native plantings to the Domain. In 2002 the Andrew "Boy" Charlton Pool was redeveloped by the Sydney City Council in the outer Domain on Woolloomooloo Bay. In 2004 new sound walls were built (and their inside face planted) facing the Cahill Expressway to mitigate increased noise from the Cross City Tunnel and expressway into the Phillip Precinct of The Domain. Also that year in that precinct of the Domain, the tree plantation in the Phillip Precinct of the Domain facing Hospital Road was replaced in some public controversy, removing ten previously-existing trees and planting 30 replacements (hoop pines, white figs and Washingtonia robusta fan palms) in a triple avenue arrangement. In its present configuration, The Domain covers 34 hectares (84 acres) and is still a popular venue for Sydney residents and visitors to relax and enjoy views of the City and Sydney Harbour. On any weekday lunchtime, its roads are filled with joggers and its grass used for corporate soccer and touch football competitions. The Domain today begins in the south on St Mary's Road, to the north of St Mary's Cathedral and the northeast of Hyde Park, and ends in the north at Mrs Macquarie's Point, a headland on Sydney Harbour. It is roughly divided into three sections by a road running north-south (Art Gallery Road in the south, Mrs Macquarie's Road in the north), and the east-west Cahill Expressway: the Domain occupies roughly the south-west, south-east and north-east quadrants formed by these roads, while the Royal Botanic Gardens is to the north-west. From the north-west corner of the south-west quadrant, a small band of parkland extends north along the western edge of the Royal Botanic Gardens, leading to an elevated open area overlooking the Sydney Opera House, which is also part of the Domain. The part of the Domain to the west of Art Gallery Road and to the south of Cahill Expressway consists of a large open grassed area surrounded by groups of mature trees to the east and south. It is named "Phillip Precinct" after Arthur Phillip. This area is crossed by several walkways, and has a restaurant called "Pavilion on the Park" in the north-east corner. The public institutions of Macquarie Street, such as Sydney Hospital, Parliament House and the State Library, back onto the park. Being easily accessible from Sydney's financial district via walkways through these public buildings, this part of the park is a popular area for city workers to relax, exercise and play sports. This open area frequently hosts meetings and events. During the summer months, a temporary stage is erected in the south of this area, and concerts and other events are held, with the remainder of the open grass area used for seating. The north side of this area is marked by an open-air section of the Cahill Expressway, sunken below the ground level of the park. Speakers Corner (an area for public speaking) is located in the northeastern part of this part of the Domain, close to the Art Gallery of New South Wales. Officially established in 1878, this area was historically an important gathering place where any person may turn up unannounced and talk on any subject they wish, although they were likely to be heckled by people holding opposing views. This has historically been the focal point of free speech in Sydney. Although now largely disused, the corner's role is enshrined in legislation, and a steel platform with engravings commemorating notable speakers still occasionally attracts speakers on Sunday afternoons. 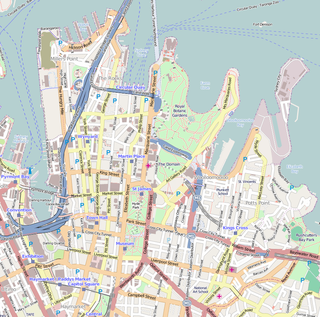 The part of the Domain to the east of Art Gallery Road and to the south and west of Cahill Expressway falls in the east via a sharp slope towards the much lower-lying Woolloomooloo. It is named the "Crescent Precinct" after the Sir John Young Crescent that marks its eastern boundary. This part of the Domain is dominated by the Art Gallery of New South Wales, with a neo-classical façade facing Art Gallery Road and a modern extension built onto the eastern slope. near the southern end of Art Gallery Road is the main entrance to the Domain from the junction of Prince Albert Road, College Street and St Mary's Road, which features a historical gatehouse. Playing fields occupy the south-east of this area, built above the Domain Parking Station. The Domain Parking Station is a 1,130 space car park that caters predominantly for The Art Gallery of NSW patrons, The Domain event attendees, and inner city workers, now known as "Domain Car Park". The Domain Car Park also houses a moving walkway which takes parkers from the car park to the top of Hyde Park. The walkway, or travelator, is an impressive 207 metres in length. The Express Walkway features a painted mural along the length of the walkway that depicts Aboriginal and local scenes, and the Walkway is most likely the longest continuous moving walkway in the Southern Hemisphere and reportedly the third longest in the world. North of the Art Gallery of New South Wales, Art Gallery Road passes over the Cahill Expressway, with a narrow section of parkland built over the expressway connecting the Crescent Precinct with the "Yurong Precinct" at Mrs Macquaries Point. In this section, the Domain is a narrow section of greenery bounded by the Royal Botanic Gardens to the west of the roadway and the waters of Woolloomooloo Bay to the east. To the north, the Domain occupies the entirety of the peninsula of Mrs Macquarie's Point, with Farm Cove to the west and Woolloomooloo Bay to the east. Offering the iconic view of the Sydney Opera House alongside the Sydney Harbour Bridge, Mrs Macquarie's Point is a popular destination for tourists and photographers. Mrs Macquarie's Chair was carved out of the rock for Governor Lachlan Macquarie's wife, so she could sit and observe the passing ships. Above the chair is an inscription recording the completion of Mrs Macquaries Road on 13 June 1816. The Fleet Steps link Farm Cove to Mrs Macquarie Road. It is named after the Great White Fleet of the US Navy, and was built for the visit of that fleet to Sydney in 1908. It is the point where Queen Elizabeth II first set foot on Australian soil, and a commemorative wall plaque marks the event. The site is often used for large marquee functions with stunning views of the Opera House and Harbour Bridge. The Andrew "Boy" Charlton Pool is an outdoor swimming facility beside Wolloomooloo Bay. Veil of Trees is a sculpture of glass panels installed between the pool and the "Lion Gate Lodge" of the Royal Botanic Gardens in 1999. Cut off from the rest of the Domain by the Cahill Expressway, a narrow strip of open parkland runs alongside the eastern side of Macquarie Street and the western boundary of the Royal Botanic Gardens, rising towards the north to encompass the elevated area near Bennelong Point, which overlooks the forecourt of the Sydney Opera House via a rocky escarpment. This area is named the "Tarpeian Precinct", after the resemblance of the escarpment to the Tarpeian Rock. This relatively small elevated green space dotted with large trees has views from above to parts of Circular Quay, the Harbour Bridge and the Opera House. Government House is immediately to the south-east of this area. The historical sightlines from the Tarpeian Precinct to Circular Quay and beyond were significantly disrupted by the construction of the Toaster Building. A number of major events are hosted every year in the Domain, mostly during the Summer holiday months of December and January and many as part of the Sydney Festival. These large events occur in the Phillip precinct where a temporary covered stage is erected every November for the summer festival season. Some of the more popular and long-running annual events that have become Sydney 'traditions' include the nationally televised Carols in the Domain (held on the evening of the last Saturday before Christmas) and the Sydney Festival trio of Symphony in The Domain (featuring the Sydney Symphony Orchestra), Jazz in the Domain and Opera in The Domain (featuring Opera Australia), held on consecutive Saturday evenings in January. The Tropfest short film festival was held in the Domain each February from 1999 until 2013, when it outgrew the Domain and moved four kilometres south-east to the much larger Centennial Park. An 'Open Air Cinema' operates in the summer months near the Fleet Steps. The movie screen sits on pylons in the water at Farm Cove with the audience seated along the foreshore, facing directly towards the Opera House and Harbour Bridge. The screen lies horizontally above the water of Farm Cove to allow patrons to enjoy the views before the movie begins and then lifts to the vertical position for the movie screening. The Fleet Steps are used since 2012 for annual outdoor opera stagings at the Handa Opera on Sydney Harbour, during the months of March and April. Additionally The Domain is of historical and aesthetic value on a national level for its ability to demonstrate its dual role as the prime example of a pleasure ground attached to Government House and as a leading example of a public park developed from the mid 19th century as an early designated landscape for public use (1831) the site was at the forefront of international concerns for the integration of public parks within city planning and development. From an early date the place developed, and continues to develop, a didactic role of increasing knowledge and understanding about plants through displays, public lectures, tours and social events based on the living collections and the landscape setting (social value). For its association with sporting history in Australia, as a venue for a wide range of sporting activities including the provision of sports facilities for city workers and firms' teams, the home of first class cricket in NSW from 1857-1871 and, in 1846, as the venue for the first swimming championship known to have been held in Australia. It is also known as the site of the first swimming championship known to have been held in Australia. It is also known as the site of the first formalised swimming in Sydney - an activity that continues at the site - and of the first public playground (gynasium)(historic & social value). Evidence of remnant native vegetation remaining from the time of white settlement of the Sydney area. Their being the site of the 1878 International Exhibition, and Garden Palace, a major event for Sydney and the first such exhibition in Australia, featuring works of art and industry. For their rich heritage of memorials as elements of urban design, including The Domain's Henry Kendall memorial seat, the Palace Garden Gates and wall, the Cunningham memorial island and obelisk, the monument to the forces of the Desert Mounted Corps wall, the Captain Arthur Phillip fountain monument and the sunken garden memorial to the Pioneers. For their rich tradition of gently curving walls, including the two Macquarie walls, the Farm Cove sea wall, the Woolloomooloo gates and wall, the Government House western terrace walls and the walls that originally contained The Domain. Their fine collection of trees from the South Pacific and other Pacific regions, including of the Araucariaceae family (e.g. : the Araucaria and Agathis genera) and figs (the genus Ficus). As a habitat to a threatened fauna species, the grey headed flying fox (bat). The Gardens and The Domain are identified in the Archaeological Zoning Plan for Central Sydney as an Area of Archaeological Potential, with the potential to yield information that will contribute to an understanding of NSW's cultural or natural history. It is an area potentially rich in archaeological remains, dating from Aboriginal occupation and the earliest years of the establishment of the colony. representative of tanks constructed by the MWS & DB for the storage of fluids in the early 20th century and reflect the then latest development of a construction design dating from the mid 19th century (criterion (g) representative). The Tarpeian Way is of State significance for its prominence as a quarried, weathered sandstone cliff face, with stone steps and iron railing, which defines the northern boundary of the Royal Botanic Gardens and the southern boundary of the Sydney Opera House. The drama, scale and simplicity of the quarried sandstone face of theTarpeian Wall plays a crucial role in supporting the entry point and setting of the Sydney Opera House, where it provides an enclosing "backstage wall" to the open forecourt space. It is considered a "crucial element in [the World Heritage] Buffer Zone . . . including its steps and upper perimeter fence. Although not legally on the Sydney Opera House site, it immediately borders and defines its southern edge and the open space of the forecourt. Because of its scale, location and configuration, it plays a crucial role in the approach and entry experience, setting, and definition, of the Sydney Opera House site." A substantial rock cutting of the Bennelong headland, undertaken in 1880 at a cost of £6,000, it enabled the extension of Macquarie Street. 'Its vertical quarried sandstone face, with its steps and fence, is an historic artefact in its own right and retains the only visible evidence of activities on the Sydney Opera House site predating the Opera House itself.' Its traces of anti-Vietnam War graffiti dating from the 1970s are of State significance as a remnant of an important Australian social movement in a major public space. The Tarpeian Way is of local significance for its associations with politicians and bureaucrats who authorised and undertook the cutting in 1880 including Sydney Alderman C. Moore, J. S. Farnell, then Minister for Lands, E. Bradridge, City Surveyor and Mr. Moriarty, the Engineer for Harbours and Rivers. The Tarpeian Way has an unusually dramatic, classical association through its name with the famous rock in Rome from which prisoners were hurled to their deaths in ancient times. The Tarpeian Way is of State social significance for the high regard in which it is held as a dramatic backdrop to the forecourt space of the Sydney Opera House, and as an access point between the Sydney Opera House and the royal Botanic Gardens. It is often used by members of the public enjoying its marvellous views of the Sydney Opera House and harbour setting. ^ "Fast fact". Royal Botanic Gardens, Sydney. Office of Environment and Heritage, NSW Government. Archived from the original on 12 July 2009. ^ a b c d e f g h i j k l m n o p q r s t u v w x y z aa ab ac ad "Royal Botanic Gardens and Domain". New South Wales State Heritage Register. Office of Environment and Heritage. H01070. Retrieved 13 October 2018. ^ a b c Morris, Colleen (23 June 2016). pers.comm. ^ a b "Victoria vs. New South Wales, 1856–57". ESPNcricinfo. ESPN Inc. Retrieved 22 November 2013. ^ "New South Wales v Victoria, 1858–59". ESPNcricinfo. ESPN Inc. Retrieved 24 November 2013. ^ "New South Wales v Victoria, 1860–61". ESPNcricinfo. ESPN Inc. Retrieved 24 November 2013. ^ "New South Wales v Victoria, 1862–63". ESPNcricinfo. ESPN Inc. Retrieved 24 November 2013. ^ "New South Wales v Victoria, 1866–67". ESPNcricinfo. ESPN Inc. Retrieved 24 November 2013. ^ "New South Wales v Victoria, 1868–69". ESPNcricinfo. ESPN Inc. Retrieved 24 November 2013. ^ Read, Stuart (21 July 2015). pers.comm. Annable, R.; Morris, C.; et al. (2004). Domain Master Plan (draft). Bickford, Anne (1999). Fig Tree Baths Site, Woolloomooloo Bay, Archaeological Assessment. Attraction Homepage (2007). "Royal Botanic Gardens and Domain". Austin, Keith (2017). 'A Sustainable Future'. Casey & Lowe (2005). Central Depot: Draft Non Indigenous Archaeological Assessment and Excavation Permit Application, Royal Botanic Gardens. Casey & Lowe Archaeology & Heritage (2007). Central Depot Redevelopment, RBG Sydney - Section 60 Excavation Permit application. Churches, David (1990). The cultural significance of the Royal Botanic Gardens, Sydney. City of Sydney Council. "Heritage LEP schedule 3 - Database Inventory Report - inventory item 8013". City Plan Heritage (2008). Domain car park Upgrade (Phase 2), Sir John Young Crsecent, Woolloomooloo : heritage impact statement. Clive Lucas, Stapleton & Partners (2005). Central Depot, Royal Botanic Gardens, Sydney - conservation management plan. Conybeare Morrison International (2005). Conservation Management Plan, Royal Botanic Gardens & Domain (draft). Davies, Karla (2014). 'The restoration of the palm collection at the Royal Botanic Garden, Sydney'. Department of Public Works & Services: Heritage Design Group (2000). Central Depot, Royal Botanic Gardens: Conservation Management Plan. Design 5 Architects (1995). Andrew (Boy) Charlton Pool, The Domain, Conservation Analysis & Policy, Sydney. GML Heritage (2014). Royal Botanic Garden and the Domain, Sydney - Conservation Management Plan. Godden Mackay Logan (2004). Conservation Management Plan for the Phillip Precinct / Hospital Road figs. Godden Mackay Logan (2003). Oil Tanks - Royal Botanic Gardens - preliminary heritage advice. Godden Mackay Logan (2001). Andrew 'Boy' Charlton Pool, Research Design. Godden Mackay Logan (2001). Mrs Macquaries Road: Archaeological Assessment & Research Design. Godden Mackay Logan (1999). Domain Lodge Precinct: Archaeological Assessment & Research Design. Godden Mackay Logan (1999). NSW Police Wall of Remembrance - draft Heritage Impact Statement. Godden Mackay Logan (1999). Royal Botanic Gardens and Outer Domain: Archaeological Assessment and Research Design:. Gorman, James (2013). 'Gallery's big vision for $10.8m', in Sydney Central Magazine, 26/6/13. Grant, ?. (1997). The Gardener of Swifts. Haglund & Associates (2007). Royal Botanic gardens - Central Depot redevelopment : Report on test excavations completed in compliance with S87 Permit #2364. Haglund & Associates (2005). Central Depot redevelopment - Draft Assessment of potential impacts on Aboriginal Heritage Values. Hassell P/L (a) (2009). Section 96 (1) Application Seeking to Modify Consent D/2008/1118, February 2009. Hassell P/L (b) (2009). Section 96 (2) Application seeking to modify consent D1118/2008, February 2009. Henty, Carol (1988). For the Peoples Pleasure - Australia's Botanic Gardens. Heritage Design Services, Department of Public Works & Services (2000). Victoria Lodge, Royal Botanic Gardens - Conservation Management Plan. Heritage Design Services, NSW Department of Public Works & Services (1999). Police Memorial Wall, Domain, Archaeological Monitoring Report. Heritage Group, NSW Department of Public Works & Services (1998). Brick Arched Culvert, Mrs Macquarie’s Rd., CMP. Heritage Group, NSW Department of Public Works & Services (1998). Heritage Status Report – Middle Garden Toilets, Victoria Lodge, Main Depot, Cottage 4. John Oultram Heritage & Design (2004). Rose Garden, Royal Botanic Garden, Sydney: proposed alterations & addditions. John Oultram Heritage & Design (2000). Cottage No. 4 (Superintendent's Quarters), Conservation Management Plan, Royal Botanic Gardens, Sydney, NSW. Kelly, Matthew (2004). Phillip Precinct Section 60 Application. Mather & Associates Landscape Architects (MALA) (2000). The Domain - Master Plan Outline (draft). National Trust of Australia (NSW) (1981). Survey of Gardens in New South Wales. North, Tim (attribution) (1990). The Sydney Tropical Centre. Otto Cserhalmi & Partners (1998). Sea Wall, Royal Botanic Gardens, CMP. Patty, Anna (2013). 'Government to launch inquiry into Gardens 'irregularities'. Pollard, Jack (1990). "Australia". Test Match Grounds. London: Willow Books. Robertson, Toni (2015). John Lennis (1952-2015) Baron of Bush Tucker and Botanics (obituary). Royal Botanic Gardens (1990). Royal Botanic Gardens Section 170 Register. Tourism NSW (2007). "Royal Botanic Gardens". Weir + Phillips (2005). "Heritage Impact Statement - the Vista Pavilion, Royal Botanic Gardens, Sydney". Wilson, Karen (2012). 'Another Significant Anniversary' in "The Gardens", Summer 2012-2013. Vamplew, Wray; Moore, Katharine; O’Hara, John; Chashman, Richard; Jobling, Ian, eds. (1997). The Oxford Companion to Australian Sport (Second ed.). Melbourne: Oxford University Press. This Wikipedia article contains material from Royal Botanic Gardens and Domain, entry number 1070 in the New South Wales State Heritage Register published by the State of New South Wales and Office of Environment and Heritage 2018 under CC-BY 4.0 licence, accessed on 13 October 2018. Wikimedia Commons has media related to The Domain, Sydney. The Sydney Conservatorium of Music is a heritage-listed music school in Macquarie Street, Sydney, New South Wales, Australia. It is one of the oldest and most prestigious music schools in Australia. Located adjacent to the Royal Botanic Gardens on the eastern fringe of the Sydney central business district, the Conservatorium is a faculty of the University of Sydney, and incorporates the community-based Conservatorium Open Academy and the Conservatorium High School. In addition to its secondary, undergraduate, post-graduate and community education teaching and learning functions, the Conservatorium undertakes research in various fields of music. The building was added to the New South Wales State Heritage Register on 14 January 2011. Woolloomooloo is a harbourside, inner-city eastern suburb of Sydney, New South Wales, Australia. Woolloomooloo is 1.5 kilometres east of the Sydney central business district, in the local government area of the City of Sydney. It is in a low-lying, former docklands area at the head of Woolloomooloo Bay, on Sydney Harbour. The Domain sits to the west, the locality of East Sydney is near the south-west corner of the suburb and the locality of Kings Cross is near the south-east corner. Potts Point is immediately to the east. Farm Cove is a tidal inlet and shallow bay in Sydney Harbour, separated from Sydney Cove by Bennelong Point. Known to the indigenous inhabitants of Sydney as Woccanmagully, Farm Cove was used by them as an initiation ground and for the "Kangaroo and Dog Dance". Mrs Macquarie's Chair is an exposed sandstone rock cut into the shape of a bench, on a peninsula in Sydney Harbour. It was hand carved by convicts in 1810, for Elizabeth Macquarie, the wife of Major-General Lachlan Macquarie, Governor of New South Wales. The peninsula itself is named Mrs Macquarie's Point, and is part of The Domain, near the Royal Botanic Gardens. The Blue Mountains Botanic Garden, originally known as the Mount Tomah Botanical Garden, is a 28-hectare (69-acre) public botanic garden located approximately 100 kilometres (62 mi) west of the Sydney central business district at Mount Tomah in the Blue Mountains, in New South Wales, Australia. The garden is heritage-listed and is located on the boundary of the UNESCO World Heritage Site Greater Blue Mountains Area and can be accessed via the Bells Line of Road. The Callan Park Hospital for the Insane is a heritage-listed former insane asylum and now college campus located in the grounds of Callan Park, an area on the shores of Iron Cove in Lilyfield, a suburb of Sydney, New South Wales, Australia. In 1915 the facility was renamed as the Callan Park Mental Hospital, and again in 1976 to Callan Park Hospital. Since 1994, the facility has been formally known as Rozelle Hospital. In April 2008, all Rozelle Hospital services and patients were transferred to Concord Hospital. The Callan Park Act, 2002 (NSW) restricts future uses of the site to health and education. The Dawes Point Battery remains is a heritage-listed former artillery fortification and now visitor attraction located adjacent to the southern pylon of the Sydney Harbour Bridge at Hickson Road in inner city Sydney, on the boundary between Dawes Point and The Rocks in the City of Sydney local government area of New South Wales, Australia. It was built and modified from 1791 to 1925 by Lieutenant William Dawes, Robert Ross, Francis Greenway, and George Barney. The property is owned by Property NSW, an agency of the Government of New South Wales. It was added to the New South Wales State Heritage Register on 10 May 2002. The Old Government House is a heritage-listed former "country" residence used by ten early governors of New South Wales between 1800 and 1847, located in Parramatta Park in Parramatta, New South Wales, now a suburb of Sydney, New South Wales, Australia. It is considered a property of national and international significance as an archaeological resource. It also serves to demonstrate how the British Empire expanded and Australian society has evolved since 1788. Denbigh is a heritage-listed former vineyard, Clydesdale horse stude, Ayrshire cattle stud and dairy farm and now Hereford stud located at 421 The Northern Road in the southern-western Sydney suburb of Cobbitty in the Camden Council local government area of New South Wales, Australia. It was built during 1818 by Charles Hook in c. 1818 and by Thomas and Samual Hassall, and Daniel Roberts in c. 1828. The property is privately owned. It was added to the New South Wales State Heritage Register on 22 December 2006. The Man O'War Steps is a heritage-listed jetty located at Farm Cove Crescent, in the Sydney central business district, in the City of Sydney local government area of New South Wales, Australia. It was built from 1810. The property is owned by NSW Maritime, an agency of the Government of New South Wales. It was added to the New South Wales State Heritage Register on 18 April 2000. The Steps are located on the eastern bank of Bennelong Point, adjacent to the Sydney Opera House and on the north-western boundary of the Royal Botanic Garden.